Today I found out what the things you see when you close your eyes and rub them hard are called, namely “phosphenes”. A phosphene is characterized by perceiving some form of light when there is little or no light actually entering the eye, making it an entopic phenomenon (meaning the source of the phenomenon is within the eye itself). 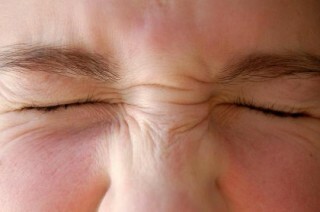 Phosphenes are most commonly introduced by simply closing your eyes and rubbing them or squeezing them shut, tightly; generally the harder you rub or squeeze, the more phosphenes you’ll see. This pressure stimulates the cells of the retina and, thus, makes your brain think you are seeing light. Specifically, Grüsser et al. demonstrated that pressure in the eye results in activation of retinal ganglion cells in a very similar way to how they activate as a response to light. There are also several other ways phosphenes can be generated. These include through: electrical stimulation; intense magnetic fields; hallucinogenic drugs (phosphenes not to be confused with hallucinations, which are generated in the brain, not the eye); a blow to the head or a particularly severe sneeze where extra pressure is created in the eye on the retina and possible stimulation of the visual cortex; low blood pressure, which can be experienced if you stand up really fast after you’ve been relaxing; exposure to radiation; meditation or extended visual sensory deprivation; various side effects from medical drugs; and certain diseases of the retina and nerves. The word “phosphene” was coined by surgeon JBH Savigny deriving from the Greek “phos”, meaning “light”, and “phainein”, meaning “to show”. When phosphenes show up during meditation, they are more commonly known as “nimitta”. In Buddhist psychology and philosophy, this simply refers to forms, shapes, colors, sounds, etc. perceived during meditation. Prisoners who are being sensory deprived also occasionally will experience this phenomenon; in this case, it is often called “prisoner’s cinema”. A phosphene is not to be confused with phosphine, which is a toxic and explosive gas. The first documented electrically produced phosphenes were by neurologist Otfrid Foerster in 1929. The first documented reference to any type of phosphene goes back all the way to the ancient Greeks, though they didn’t call them phosphenes obviously. Scientists Brindley and Rushton, in 1974, once successfully created a type of visual prosthesis that allowed certain blind people to see Braille spots using phosphenes. This device only works on blind people whose brains were capable of processing visual information, such as those who once could see, but lost their sight in an accident or the like. More recently, researchers have successfully developed brain-computer interfaces for certain blind people that create phosphenes such that it mimics what the person would see, if their eyes worked, so somewhat restoring their vision. Both these visual prosthesis work through electrically produced phosphenes. I once read somewhere that Salvador Dali loved pressing his eyes to induce them when he was a child. You also see this when you intake drugs. Does anybody else see tiny chains all connected, but you can’t get a good look at them? They move against each other, and seem to change shape? I see extremely small hexagons, almost like looking at a beehive but really small. I notice that they become more apparent when you’ve stared at something for a while, or they are tired, and you give them a good rub to rejuvinate them. I see rapidly changing geometric patterns of various colors when I squeeze my eyes shut. They shift in shape and color and then fade to black. Quite a little light show. I want to know if it’s bad…like will rubbing damage your eyes? How about these: you are also on a clear bright day and you stare at the blue sky… after some time you start seeing little bright dots flying around against the blue yonder. Of course, you cannot follow them with your eyes. When i press down on my eyes i see colours (usually green but i see other ones too) and sometimes i see images i have never seen before! and when i open my eyes again everything goes fuzzy and all colours go flat for a couple of seconds. what i see changes every couple of seconds,is this normal??? First I see paisley patterns then that fades, then blue shapes that fade then another comes right behind it. When rubbing my eyes in the shower, I saw something similar to an eye, there were many at first. They all started to gravitate towards each other forming the shape of an eye…or a green circle with a black dot in it that pulsated the more i focused. It was similar to how our pupils increase and decrease due to our focusing in and out of something. The more I focused the clearer it got. Kinda started to freak me out…but I think it’s pretty kool! Firstly zig zag black and white lines. Then a white room lined with evenly spaced what can only be described as hieroglyphics. Even though they are crisp and clear I cannot draw them after. The same thing happens whenever I apply pressure. I find it annoying that I cannot progress further. I see a pattern of little spots whenever I close my eyes. It appears very much like the tinnitus from which I suffer in my ears though not nearly to the extreme degree. It seems to be worsening as I grow older and under low light conditions or low contrast visual conditions, I even see them with my eyes open. These lights seem like they might be spirits that come inside our bodies but are not our body’s spirit, and it seems there can be more than one of these in a single body. They seem to differ in appearance as much as they differ in the type of spirit it is. I once thought they might all be evil but now it seems like they’re only evil if you think they are, especially if you treat them as such. If this happens it doesn’t change instantly but takes time, like rebuilding trust with another person in real life… And it generally seems to require a thing about yourself to change in order to achieve long lasting results. Maybe some are only good, some are only evil, and most of them can be either depending on us? If so I’ve only experienced negativity when trying to discern between good and bad spirits but it seems very apparent to me you cannot tell by their appearance alone, like I thought you could at first. I’m still not sure if its ever even possible to know when a spirit is bad or not. Because if they look scary, and act scary, then it might mean there’s something wrong with us rather than with the spirit as it seems to have been for me in my experiences. Either that or proper behavior and thoughts links you up to good spirits and negative behavior and thoughts makes you see negative spirits in places where you’d see good spirits otherwise? Either way it never worked for me to “combat” spirits that appeared evil to me. That just made things worse for me in my experience. I might be wrong but it seems more beneficial to think of the spirits inside of you positively if nothing of apparent evil is in your life otherwise, or perhaps if an evil in your life exists, it might mean you need a “deliverance” (more effective and easier on you than an exorcism) or to become an optimistic and positive person biologically, mentally, physically, and spiritually. It seems everything of supernatural origin is quasi-real meaning there’s a level of objectivity and subjectivity to it and both can effect a person and their environment physically and can be seen by other in some specific situations (but not all situations). Fine details seem to differ from person to person even if they’re seeing the same spirit. But overall, there seems to be a limited number of spirits, and supernatural stuff in general, that different people can experience that will be consistent overall (except in fine details) between each individual person. Interesting. I see a field of squares likened to a black and white sheet of graphing paper. I was wondering if I was the only one. Now, after reading the comments on this web link, I “see” that it seems to be an individual experience. Different people see different things, but some people see similar things. Awesome!